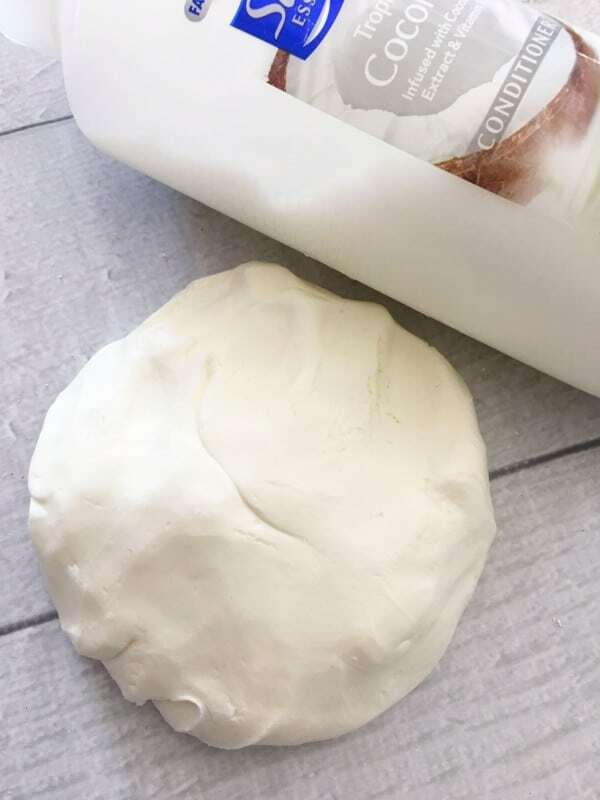 The kids will love the fun of this 2 ingredient fluffy cloud dough and you will love how easy and inexpensive it is to make! If you have kids at home these days, you’re probably well acquainted with the rage of homemade slime and cloud dough. Katy and her best friend, Sara Jane are both twelve, so they are at the prime age for crafting things like this. 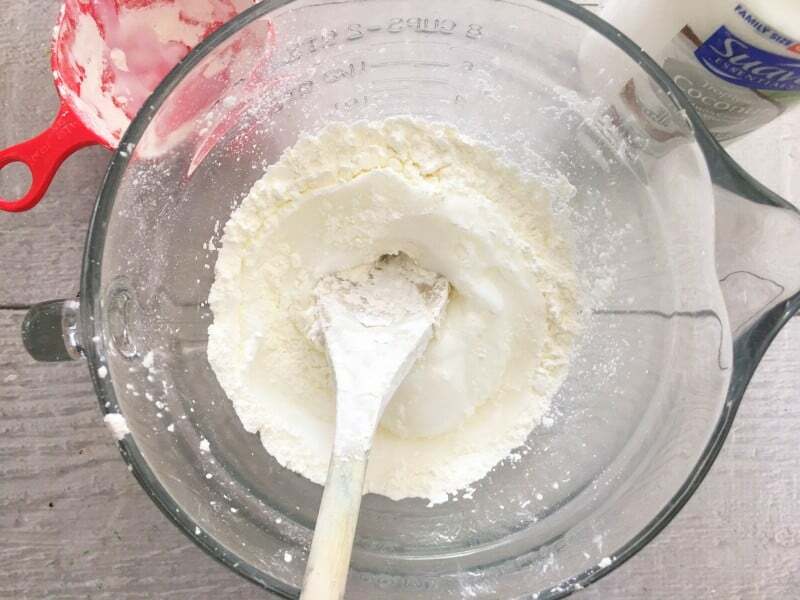 Today I’m bringing you a super simple recipe for fluffy cloud dough that only takes two ingredients – and you may already have them. If you don’t, they are inexpensive. This is also easy peasy to make. A Printable “recipe” is at the bottom of this post. You’ll need: Corn Starch and Scented Conditioner. Any conditioner will do but I like to stick with Suave because it is inexpensive and smells good. Today we’re using coconut. I’ve also used strawberry and it was wonderful as well. Measure out your corn starch into a bowl and add conditioner. Begin stirring until it’s well incorporated but crumbly and hard to mix. Now we need to use our hands. Knead it together until it becomes smooth. Continue kneading until it’s fully blended and cloud like. Store in an airtight container when you’re not enjoying it. Have fun with your cloud dough! Measure and add your cornstarch to a large mixing bowl. 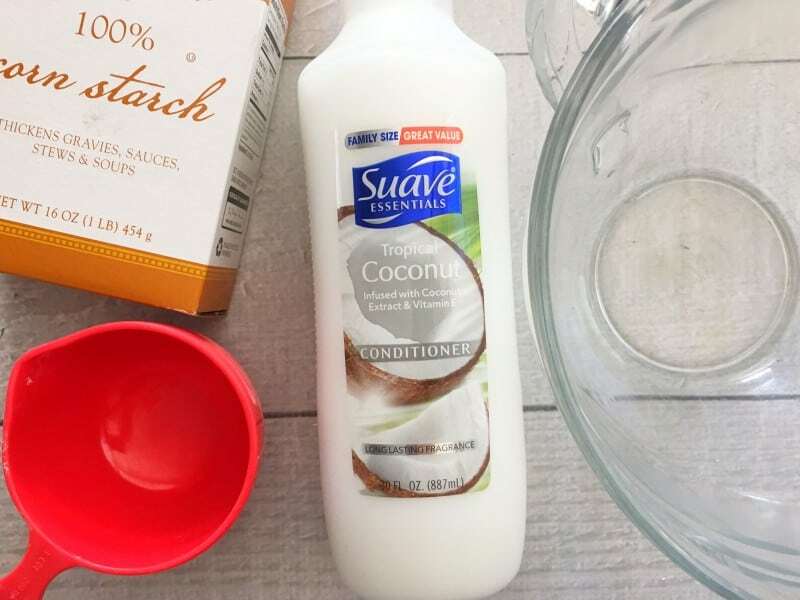 Measure your conditioner and pour into your bowl of cornstarch. Use a long spatula to mix your two ingredients until it gets hard to mix. Use your hands too finish kneading the dough together. One way I do this is to put it all in a gallon zipper seal bag and continue kneading it. Now it's ready for play! *you can use any conditioner but scented is the best. Tropical Pink – A Non Alcoholic Fun Fruity Drink For Summer! Will adding food coloring to this , like they do with slime work with this recipe? I will get the ingredients so my granddaughter, also 12, can make it this weekend. I hope y’all have a fun time and make lots of memories while making this!!! This looks like such fun! My 6 year old grandson is coming to visit me in a couple of weeks. I know that he will love making this with me. Thank you so much for sharing this with us, Christy. You are such a blessing to so many. Thank you so much Linda!! I hope you and your grandson have a great time making memories!!! Yes, it is messy. 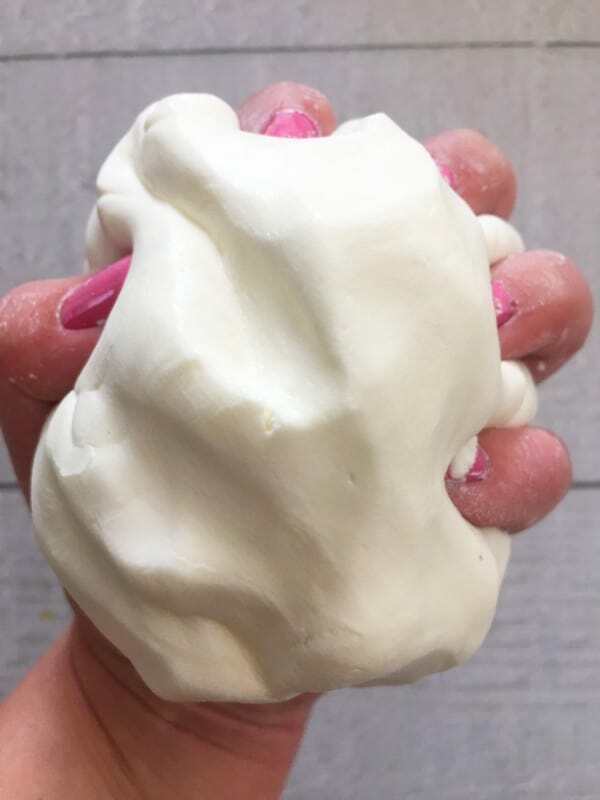 I have made this with my 10-year-old daughter (who is an avid slime maker) and she found cloud dough to be fun at first, but it dries out VERY fast and gets crumbly. Honestly, we prefer to make doughs that last a bit longer. I have a 12 year old daughter that would love this. She is very creative and I can see her making sculptures from this. I would like to know if this is not kept in an air tight container will turn hard? 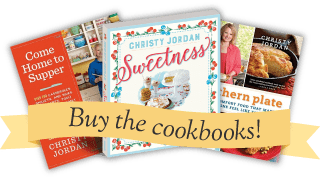 Thank you so much for all your great recipes, inspirational postings, and all the great tips that you are so generous in sharing with us. This stuff is even fun for grown-up kids. This sounds amazing. I would love to make it with my special education class. Does it make a lot? Or is this recipe per person? Thanks! What do I do when they make something you want to keep? just let it dry out? Can we add half corn starch if we don’t have Enough? Yes, it is very messy (see my comment above). Not a favorite of mine. Thank you so much for this recipe. Slime is a lot of fun but the shaving cream scent is awful. A gallon of glue is also something that has a definite “interest” shelf life. Again from a Grandma, this is a “craft” changer. KNEAD KNEAD KNEAD!! 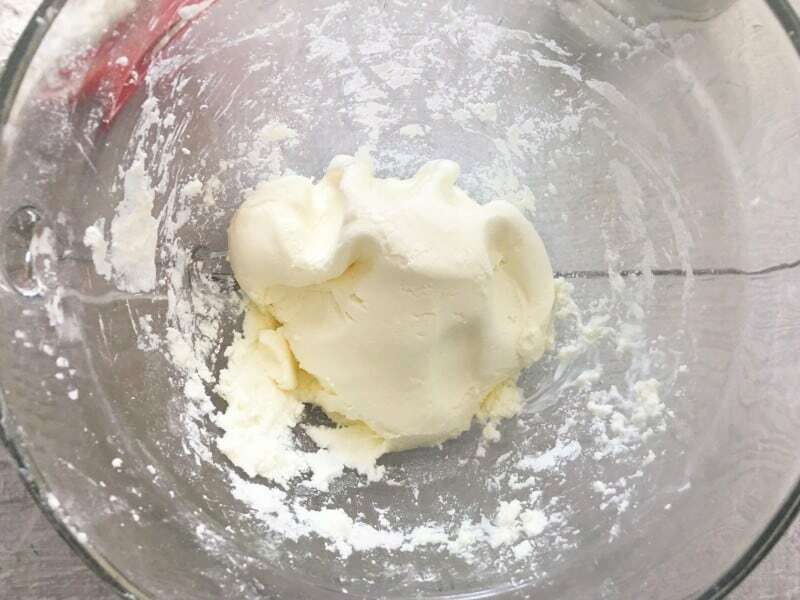 I almost gave up on this sensory project because when you first mix the ingredients together it’s a very weird consistency but I kept kneading and it was perfect!! I used White Rain conditioner from the dollar store and Iberia corn starch from Publix. Thanks the kids loved it!! I am glad it finally came together for you and the kids enjoyed it!! What type of items can you make with this? I work in a nursing home and this seems like a great idea. Let me know. Thanks. Would you be able to put the ingredients in a large container with a lid and shake to mix, then knead it? 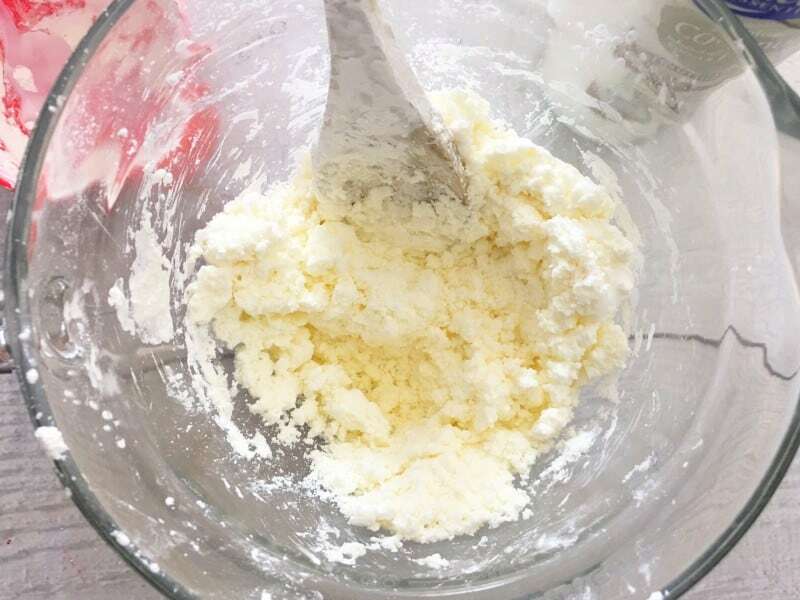 I added too much conditioner and I am out of cornstarch, can I add something else to make it less sticky? This also makes your hands really soft! My granddaughter and I had a lot of fun with it. Of course we colored it pink.